With the demise of the half dollar as a circulating coin, the quarter dollar coin became the workhorse coin of American commerce. That made the George Washington quarter the most widely used and most recognizable coin produced by the US Mint. But very few people realize that the quarter used to be minted from silver, with versions dated 1964 and before containing 90% silver. The Washington quarter was first minted in 1932 to commemorate the bicentennial of George Washington’s birth. The initial intent was to produce it only for that year and then revert to the Standing Liberty quarter but Congress made the change permanent. Mintage of the Washington quarter continues to this day, although the eagle reverse has not been minted since the beginning of the Statehood Quarter program in 1999. 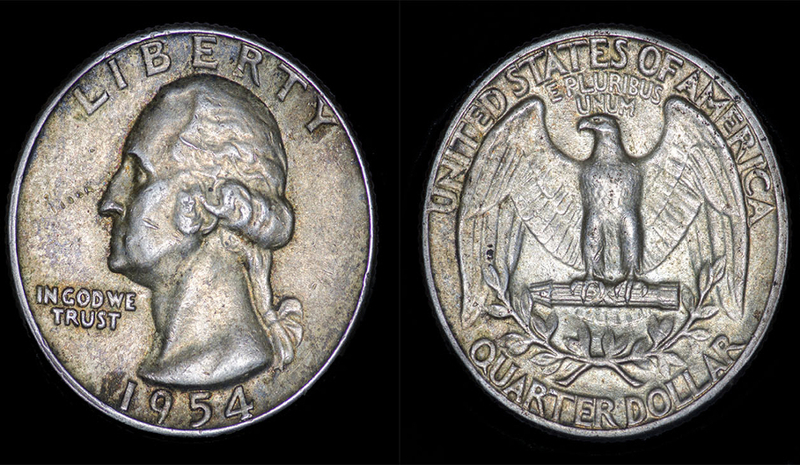 From 1932 to 1964 the Washington quarter was minted from the standard composition of 90% silver. Each coin contained 0.18084 troy ounces of silver. Nearly 3.8 billion silver Washington quarters were produced through 1964, with over 1/3 of that production being dated 1964 as the US was experiencing a coin shortage due to high silver prices and coin hoarding. While most silver Washington quarters were pulled from circulation through hoarding, it isn’t impossible to find them still in circulation, particularly in areas in which cash usage is high due to underbanking. At current silver prices the silver George Washington quarters are worth about $2.75. Like most older circulating precious metal coins, the George Washington silver quarters are not eligible for investment through a silver IRA or precious metals IRA as their silver content is too low. But for the investor looking to hold a piece of history or invest in silver that could be useful in a survival scenario, the Washington quarter is a great choice. Silver Content: 0.18084 troy oz.